Description: MPI 100 is a Fairbanks-Morse H-12-44 switcher, still on AAR Type A trucks instead of the F-M design trucks. The unit was part of the Orange Empire Railway Museum at Perris, CA in summer 1991. 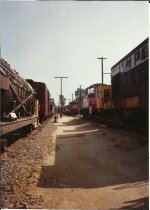 Description: This view shows a few of the diesel locomotives on display as part of the Orange Empire Railway Museum at Perris, CA in summer 1991. MPI 100 and SP 3100 are two of the more easily recognized units in this photo.